Used cars are cheaper than new cars. New cars generally depreciate 1/3 of their value in the first year. For more on depreciation see this calculator. A 2-3 year old car is still in usually going to be in very good shape and with the quality of vehicles nowadays cars should easily last 5-10 years. To me it really makes sense to buy a slightly used car instead of a new car. You get a nearly new car for 2/3 the cost and it will run just fine. Leasing a car is an even worse option than buying new or used. Leasing cars generally only useful in lowering payments so you can afford a more expensive car. But with a lease you retain no value and simply paying high rent. If you buy 2 year old used cars instead of buying new and then drive them for 5 years you will save a significant amount of money over time. If you bought used cars instead of new then you could save $391k over a 40 year period. I showed the break down here. I assumed a 10% investment return for sake of example. Note: This is just a rough estimate, I do not account for increased maintenance costs with used cars or higher insurance premiums on new cars. Imagine how much more comfortable you would be in retirement if you had that extra $391k in retirement. Is a slightly newer car really worth it? FreeMoneyFiance: Saving on a car purchase, buy used. The Benefits of buying used. I'm a fan of real estate investment in general. However I recognize that it has a lot of down sides along with the benefits. In general the primary pros and cons of rental real estate investments as I see them are below. Good potential return. Real estate gives you returns via property value appreciation, rental receipts and these can give a significant return % rate especially if you're leveraging a loan. Relatively low volatility. Property values do not fall or rise excessively fast compared to some other investments. Tax benefits. You are able to deduct depreciation and expenses from your rentals. This can eliminate a substantial amount of your tax burden. Inflation protection. Rental receipts should increase over time along with inflation. Simplicity. Buying a house and renting it out is a fairly straight forward investment vehicle and does not require advanced knowledge of the finances. Steady demand. Its basically a recession proof investment. People will always need homes. The work involved in being a landlord. No matter how you handle it there is work involved in managing an investment property. Whether you do the work yourself or if you hire a property manager, you have to expend some energy. Not a short term investment. If you are going to invest in real estate then you really need to be in the investment for years. Real estate is definitely not a short term venture. Extra liability. If anything goes wrong with the rental then you can be held liable. Lack of diversification. With real estate your eggs are all in 1 or a few small baskets. If you have problems with these properties or the area they are in then the damage will impact your entire investment. Poor liquidity. You can't sell a rental property with a click of a button. It might take months to have a property sell. Lack of mobility. If you own a property then you can not easily pickup and move across the country and take the property with you. If you move you are either faced with managing a property long distance (not recommended) or selling the property prematurely. I currently drive a 2004 Toyota Camry that I bought used about a year ago. When I was buying the car last year I specifically looked for a 4 cylinder engine instead of the V6. The 4 cylinder engine is plenty. Since I've owned the car I've never lacked power. I purposefully looked for a 4 cylinder since I knew it got better MPG and would save me money in the long run. Over the Memorial day weekend I took a 4 day trip to visit family. It was 800 miles round trip. The V6 model Camry is rated at 29MPG and the 4 cylinder is rated at 32 MPG. So for that 800 mile trip the V6 would take 27.5 gallons and my 4 cylinder uses just 25 gallons. Thats a 2.5 gallon gas savings for my weekend. Before we left we filled up for $3.94 a gallon. So that 2.5 gallon difference between the V6 and 4cylinder is a $9.85 savings for one weekend trip. If you look at a longer term I can estimate how much I'll save. The government Fueleconomy.gov website has a fuel economy savings calculator. WE can use it to see the long term impact. If I keep the car for 5 years and drive about 10,000 miles a year with 75% city and 25% highway and assume gas costs $4 then the 4 cylinder will save me about $783 over 5 years. The 4 cylinder engine has more than enough power and saves me gas money. So if you're looking to buy a car that has options for 4 cylinder or V6 engines then I'd strongly recommend looking for the 4 cylinder option instead. This is the kind of thing my dad likes to rant about. He'll comment how "we buy everything from China nowadays". It can seem like its true if you go to the store and look at the "made in China" labels on what seems like everything. But its not really true at all. Our 2007 annual trade information. In 2007 we imported $2.3 trillion in goods and services. We bought $321 billion from China which is only 13.8% of our imports. Hardly "everything" as my dad would declare. In fact we imported $354B from the European Union which is more than from China and we imported $523 from our neighbors in Mexico ($210b) and Canada ($313b) combined. We do NOT buy everything from China. I've always thought that reverse mortgages are a great idea. It allows a retired couple to cash in the value of their home for living money yet still live in the property. If you are cash strapped then using a reverse mortgage to help your finances is definitely something to look into. If you're not familiar with reverse mortgages (aka home equity conversion mortgage HECM), the basic idea is that you setup a contract with a bank where they pay you a monthly amount over time and then when you pass away the home is given over to the bank. Its basically a mortgage in reverse, hence the name. I did a quick estimate using the Wells Fargo calculator and a $250,000 house would get a couple aged 65 a monthly payment of $831 for the lifetime of both spouses. That can be a decent boost in income if you don't have much for a pension or savings. One obvious downside to reverse mortgages is that you will not have the home to leave to your heirs in your estate. But personally I don't think that's a concern. If you are not making much income and are retired then its much more important that you keep a decent standard of living than provide for an estate after you're gone. But be careful. As Money magazine reports there are some traps to be wary of with reverse mortgages. They report that there are financial institutions trying to pitch other financial services along with reverse mortgages. The services pitched are annuities and long term care which may be too expensive or unnecessary. So be careful. But is a reverse mortgage right for you? Maybe. The AARP site has a page with 5 questions to ask yourself if you're considering a reverse mortgage. 10 Things to know if you're interested in a Reverse Mortgage from HUD. If you are not a member of ColumbiaHouse and buy any amount of DVDs then I'd strongly recommend joining them. You get 5 DVDs for 49 cents each plus shipping and handling. Thats a pretty great deal even if S/H does run $2-3 a disc. But once you've joined and already gotten the sweet deal on the first 5 DVDS, then is it worth it to stay in the club or should you just buy off a discount site like Amazon?? I'm a current member of ColumbiaHouse right now. I haven't bought any DVDs there for a while but I have bought many in the past. They routinely run deals like 'buy 1 get 1 free' or the offer they have right now 'buy 1 and get 60% off'. If you bought the DVD's individually it would be cheaper on Amazon for The Golden Compass or I Am Legend and about equal for Transformers. Amazon has free shipping on orders over $25 usually. Columbia shipping will run you $2-3 in shipping per DVD. Conclusion: If you buy a lot of DVDs and buy can multiple ones at a time then you can save with Columbia House. But if you only buy a few DVDs or buy 1-2 at a time at most then Amazon will probably be better prices overall. The IRS has an FAQ on the economic stimulus. Theres a lot of common questions with answers there. When will you get the check? The schedule is posted here. If you did direct deposit you should have it by now. Paper checks are going out May 11 to July 11 in order of the last 2 digits on your social security number. How much will I get? Here is a calculator to estimate your payment. The maximum payments are $600 for single people and $1200 for couples. But if you made too much (over $75k single or $150k married) or didn't pay enough in taxes then your check will be less. Not everyone will get a check. My income is too high so I don't get a check. But if your economic situation changes in the year then you might get a credit on your 2008 taxes. Trends in Home Prices: national, metros and your own home. They say that prices dropped a record of 3.7% from March 2007 to March 2008. Metros: Money also has Home Prices by City for the largest 292 metro areas so it is pretty likely to cover your home city if you live in a decent size metro. The Matrix site has some nice graphics showing national map and trends per county. Your home: One way to get a measure of the value of your own home is to check on the site Zillow.com Zillow estimates home prices per address and is likely to have your home if it has ever recorded a sale. They estimate your house price based on the market in your area by tracking sales. So if houses are selling for more or less in your city/ neighborhood then you can figure that your house will be fore or less as well. Zillow estimates are only rough figures and don't know anything about the specific condition of the home, so its only a rough ballpark. Previously I mentioned the impact of dropping dollar on the cost of oil. But today in the news I see that our Energy Secretary is blaming the increase in price on tight supply and then suggests we should open natural parks to oil exploration. I don't think that argument holds up to much scrutiny and I think its motivated by a desire to increase oil production. Contrary to our energy secretary, here is a well stated article from Reason Online, : Oil Price Bubble? Supply is up, demand is down, yet the price is soaring. Here's why. It argues that there are 3 main reasons why oil is going up so much: 1) the weak dollar, 2) political turmoil, 3) speculation. You can read the article yourself for the details. It makes a good argument in my opinion. I decided to look into the demand / supply situation myself. The Energy Information Administration (EIA) from the U.S. government has a lot of data on energy usage. From that site I found information on worldwide oil supply, worldwide oil demand, OPEC specific usage, etc. They have solid numbers up to at least 2006 and some stuff for 2007. I think this is the most recent published data available. From the data I see, worldwide oil supply is keeping up with demand. From 1999 to 2007 world wide oil consumption went up 12.8% and world oil production went up 13%. The Reason article also then says that production went up 2.5% from the first quarter of 2007 to first quarter 2008 and consumption went up 2%. However, I will note that some years the production is a little less than the consumption. This could cause price increases. But I don't see any trend of that happening in the past. 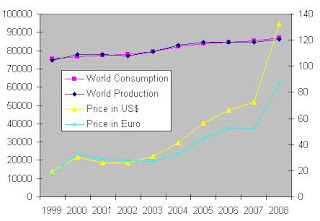 Consumption was more than production in 1999 and 2002 but oil didn't go up a large % in price those years. As you can see the consumption and production tracked each other very closely every year from 1999 to 2008. But prices didn't start going up that much until just recently in 2007-2008. To get the value of the Euro I used this Wiki page which quotes high/low annual Euro / USD exchange rates then I took an average of the high and low for each years figures. Again, comparing the price in US$ and Euro is pretty revealing. While he price in US dollars has quadrupled in the past several years, the price in Euro has not increased quite as fast. If you traveled overseas 1996 to 2006 you might be due a 1-3% refund. The banks and credit card companies were charging fees for conversion of foreign currency on card transactions made overseas but failing to notify customers about the fees. There was a class action lawsuit against the credit cards and banks and it was settled with the banks and credit card companies agreeing to pay $336 Million dollars. Of course the banks and credit cards claim they did nothing unlawful or wrong, but handing over 1/3 a Billion dollars kinda says otherwise to me. If you have used a credit or debit card for foreign travel in that 10 year period then make sure to check into the site. Settlement isn't' finalized but you could get up to 3% of your money back. So if you do have any foreign travel in 1996 to 2006 then head over to http://www.ccfsettlement.com/ and file a claim. The deadline for filing a claim is May 30 2008 so you've only got a few days left. What is the equivalent rate of return on social security? If you were able to save the Social Security tax payments for your whole life in a retirement account, then what % rate return on your money would you have to earn in order to gain retirement income equivalent to Social Security retirement benefits? Basically what I'll be doing is comparing the return you get from Social Security as a retirement system to the return you might get with a private retirement fund. This is actually a pretty complicated question to answer. There are a few parts to answering this. First we need to know how much money you make over the years. Second we need to know how much social security would pay out for retirement benefits. Third we need to know what it would cost to buy that benefit in an inflation adjusted annuity. Lastly we will have to figure the rate of return to save the amount needed to buy the annuity. 1. What is the income earned? I'm going to simply pick income levels to test with. I'll use 3 different figures to get an even range. I'm going to use values that are multiples of the approximate per income level to equate to low, middle and high income. Starting with the per income level of $27,239 for 2006 I'll use that as the low income value. Then 2 times that value or $54,478 for a middle income and finally quadruple the per income value for $108,956 for the high income value. 2. What are the social security benefits? The Social Security website has a Social Security Quick Calculator that will estimate your Social Security benefits at retirement age. Using the calculator we can figure the Social Security retirement benefit for someone who is about to retire. I put in a birth date of 6/15/1943 and earnings for he current year of $27,239. The amount $27,239 is the per capita income for 2006 so this is an estimate of average wage. With these figures the calculator estimates that the Social Security benefit would be $884 a month at age 66 in 2009. Using the same birth date an income of $54,478 results in benefit of $1,369 and an income of $108,956 gives benefit of $2,010. Note that the benefit rates are not proportional. They are 0.032, 0.025 and 0.018 respectively. So the low income person is getting a higher return from each $1 they put in than the higher income person. The social security system is a progressive tax system. 3. How Much would an annuity cost? 4. What rate of return on the saved money would we need to get to buy the equivalent retirement benefits? Using my method to calculate rate of return, I can find the % return you would need to make on your money in order to buy the annuity equivalent to the social security payment. So there you have it: By my figuring, the return rate from social security varies from 2.2% to 7.0% The typical worker is probably in the middle range of 4-5%. Keep in mind that this does not count the value of disability insurance. Also keep in mind that I'm just doing rough figuring here and my information is only as good as the data I have to work with. First off there is a study from the Social Security Administration that discusses rate of returns from SS. That study has return numbers ranging from 0.44% to 9%. The low of 0.44% is for a high income single person retiring in 2069 and the high of 9% for a low income one earner couple who retired in 1985. Another calculator to estimate returns can be found at the Political Calculations blog. Their results seem to be in the 0.3% to 5.6% range depending on situation. The paper Rate of Return from Social Security from Federal Reserve bank of San Francisco stated that : "The authors find that, under current OASI rules, today's lowest paid workers (those in the bottom 20% of the income distribution based on lifetime earnings) can expect internal rates of return between 4% and 5% after adjusting for inflation (Panel A). Today's middle income workers can expect real rates of return between 1% and 2%." Part of the increasing cost of oil is due to the drop in the value of the US dollar. Its not just that oil is more expensive, its also cause our dollar buys much less. For example: Back in ‘99-’00 a US dollar was worth about 1 Euro. But today a dollar is only worth 0.64 Euro So if a barrel of oil went up from $30 in 99 to $120 today it only went from 30 Euro to about 77 Euro. Thats a 300% increase in US dollars but only a 157% increase in EUros. If the US dollar gets stronger in the future, then the oil prices will look much better to us here in the US. What if we invested our money instead of Social Security? AllFinancialMatter.com recently posted an article How Much Could You Have If Social Security Were Your money? I found out about the article over at Free Money Finance. First some points on the article from AllFinancialMatters.com It calculates the value of a social security account using the maximum possible withholding tax which only a small % of us actually pay. Most of us just don't gross $97,500 a year in W2 wages. The article also assumes a 10% return. To get a 10% return you are going to have to accept risk in your investments. If comparing SS to conventional retirement savings it would be a more apples to apples to compare SS to an safer investment vehicle such as municipal or treasury bonds rather than the higher risk stock markets. Finally the analysis does not consider the value of social security disability which does have considerable value. Note I am not disagreeing with their general point that if you had privately invested your SS taxes over your working career that it would add up to a lot of money. That is certainly true. But how do you get from our current SS system to private accounts? Social security is not structured like a retirement account. Many people do not realize this (I didn't for a long while), but my money and your money is NOT sitting in a big bank account anywhere accumulating interest. Our taxes pay the benefits of current retired people and thats how it has worked since day one. When SS was started in the 1930's there wasn't a giant bank full of money that people had been saving for decades, it started with nothing and paid out full benefits to retirees from day 1. So you are not investing your own money nor 'wasting' your money, but instead directly funding the retirement of the current senior citizens with the understanding that when you retire the next generation will pay your benefit. Given this system, opting out of it would simply short change the current system and make the baby boomer problem that much worse by reducing funding. Because of this privatizing the system or allowing us to opt out is not something they can easily do without hurting the current benefits and tax level for those who stay in it. For what it is, social security is not that bad and it does provide a very good service to the nation. Don't get me wrong, I would love to be able to take the money that goes into SS and put it into a private IRA or 401k. But if we all did that then 54 million Americans currently receiving SS wouldn't have their checks funded. Unfortunately theres no easy way to transition from the virtual ponzi scheme we've got now to a private individual retirement investment system. SS is also a giant political hot button issue and anytime a politician talks about it they risk very big voter backlash and the elderly do vote. Buffalo Wild Wings is currently running a promotion where you can get a $5 free certificate when you buy a $25 gift card. I've been to Buffalo Wild Wings once or twice and I liked it all right. But your mileage / tastes may vary. If you dine there enough, then its an easy way to get $5 off a meal. If I read the fine print right, it looks like the deal lasts until June 15th. Also the fine print says the $5 certificate is redeemable only on subsequent visits at the same location and you can't get the deal through online gift card purchase. I've updated my net worth figure on my NetWorthIQ account. Last time in March I had $467,814 and now in May I've got $471,613 for a net worth increase of $3,799. Note on NetWorthIQ the new entry says April but it is really for May. I tried to correct the date but it didn't allow me to. Previously I discussed what annuities cost and what benefits they provide. But I didn't examine if its a good investment to buy one. So.. is it? First of all lets discuss why you might want to buy an annuity. A fixed immediate annuity provides 3 key benefits: it provides guaranteed return with virtually no risk, it lasts for the rest of your life and it requires no work on your part. But how does this compare to other options? For example you could simply put your money into CDs at a bank and roll them over annually. This would provide a guaranteed return with virtually no risk and very little work. So other simple investments are both safe and low work. But the annuity has the unique benefit that it lasts for the rest of your life no matter what your life span is. The difficulty in comparing an annuity to other investment options is accounting for the variable life span. We simply don't know in advance if we'll live for 1,2,5 or 25 more years. How can we go about estimating the value of a lifetime annuity without knowing how long you'll live? We can only take a guess really. One way would be to determine the average remaining life span for the annuitant and then value the annuity for that period. For example, when you are 65 years old, your life expectancy is approximately 19 years. (from CDC data and additional CDC information source) So if we buy an annuity at age 65 then we could compare it to expenditures for another 19 years to cover the average case. This would only be the average case though and you may live longer or shorter. If you bought an annuity at another age then you would need to find the life expectancy for that age person. The annuity we discussed previously bought at age 65 for a cost of $100,000 paid out $428 a month with inflation increases. We can estimate in the future inflation to be about the same as historical CPI average. The BLS has historical CPI data. From 1913 to 2008 the CPI inflation rate was 3.25% annually. If we start with $100,000 in the bank and pay out $428 a month with annual increases of +3.25% and also earn 3% on your savings then your balance will be depleted in a little over 18 years. If you can get a save 6% return then it would be a lot better off overall to simply invest your money on your own at that rate instead of getting an annuity. Bonds can historically give you returns of this level. Another important consideration for annuities is the fact that generally with a fixed immediate annuity after the death of the annuitant and survivor there is no value left to the estate. On the other hand if you save your money on your own then anything left over can be passed in your estate. For example say you buy an annuity at age 65 for $100,000 with monthly payment of $428 and then you pass away 10 years later. After your death the money is gone and there is no value in the annuity. On the other hand if you had put your money into savings and gotten interest of 3% and paid yourself the same $428 a month with inflation adjustment and passed away after 10 years you would still have over $66,000 in your savings that would be left to your heirs. What happens if you live a very long time? If you have an annuity then it will pay out for as long as you live. So if you live to be 100 then the annuity will still pay you. The longer you live, the more the annuity is worth. That $100,000 annuity bought at 65 would be better than a 6% savings rate if you live over the age of 95. In my personal opinion I think overall the annuity isn't the better investment for retirement. However, if the certainty of guaranteed lifelong payments regardless of your life expectancy is important enough to you then an annuity might be your preferred choice. That's basically what it comes down to: whether or not the lifelong certainty is worth paying a premium for. Continuing the discussion of annuities I'm curious if these would work as part of a retirement plan. But I don't even know what they cost or how much monthly payment they can provide. I'm looking at the Fixed Immediate annuity with inflation adjustment here. From the Vanguard Instant Quote page you can figure the costs of an annuity or the payment from a lump sum. For example I put in information for a 50 year old man and a 46 year old woman and selected an inflation adjusted annuity with 100% joint survivorship. If I paid a lump sum of $100,000 then the annuity would pay out $318.45 a month for the rest of the life of the man and wife. That basically means that the annuity would pay out the $318.45 amount monthly for the life of both the man and the woman and since its inflation adjusted it will increase the payment based on the CPI rate. If I drop the survivor benefit down to 75% instead of 100% then the payout is $332.16 a month. So $100k will buy a married couple a $318 monthly annuity at age 50. For a 50 year old man and 46 year old woman it would cost $202,281 to get a 100% survivorship joint annuity that paid $7,500 a year for the rest of their lives. The tool doesn't let you figure annuities for very large amounts, so I'm estimating larger figures by multiplying by 10. Multiplying by 10 I figure that in order to get an annuity $75,000 annual income with inflation adjustments you'd need to pay $2,022,810. For a 75% survivor annuity paying $75,000 a year the cost is $1,940,793. So if you had about $2M in the bank and are 50 years old and married to someone 46, then you could buy an annuity that would give you $75k annual income with annual inflation increases for the rest of your lives. Now lets look at someone age 65 retiring now. Lets say you've worked all your life and saved a lot of money in your 401k. You make a decent living and have accumulated $700k in your 401k total. You are now ready to retire and considering buying an annuity with your retirement funds. You have a spouse who is also 65. If you take that $700k and buy a 100% joint survivorship annuity with inflation adjustments then you would get a monthly payment of $3000. If you had just $100k saved then you would be able to afford an annuity with a $428 monthly payment. So $100k will buy you a $428 monthly annuity at age 65. These examples give some idea of how much annuities cost and pay out. The exact numbers will vary and depend on the exact age of the annuity owners and the details of the annuity. I'm only looking at Vanguard here of course so other vendors would have other options with differing prices. Is this a good buy? I'll discuss that in the future. An immediate annuity will start paying regular benefits immediately. Its basically opposite to a mortgage in the respect that you pay a lump sum now to get periodic payments over the future. A deferred annuity will pay you out payments at a future time and will let you accumulate funds until then. A fixed annuity pays a fixed or guaranteed amount over its term. A variable annuity will pay out a variable amount that may or may not have a minimum. Period annuity will pay a regular sum for a specified period of time such at 5 years, 10 years, 20 years, etc. A Life annuity will pay a regular sum for the lifetime of an individual. With a life annuity the annuity will pay the person the regular sum regardless of how long they live. So a life annuity could pay more or less depending on exactly how long you live. Use of a life annuity avoids the uncertainty in your life span for your retirement planning. To plan for retirement you have to account for how long you expect to live and a life annuity will remove that variable from the planning. You can buy an annuity for a single person. The annuity pays for the life of that person only. Or if you are married then it would normally make sense to have your annuity cover the life of both people. An annuity that covers a person and their spouse is called a survivorship annuity. A survivorship annuity will cost more than an annuity on a single individual because it is covering the lives of two individuals either of which may live longer. Normally a life annuity will pay benefits until the death of the annuitant. If the annuitant dies prematurely then the annuity would only pay for a short period. Consider if you are 65 and spend $500k on an annuity and then retire. The annuity is paying you a nice monthly sum until you die. But if you were to pass unexpectedly at age 66 then that annuity would only have paid benefits for 1 year. Your annuity would have paid out very little compared to the amount you bought it for. To account for this possibility and ensure that your annuity pays a minimum amount to your estate in the case of an early death you can buy a period with life certain annuity. A period with life certain annuity will pay for a certain period of time minimum. Be aware that annuities are typically sold with commissions and can have relatively high fees. This is one reason why annuities might be a poor choice of investments. The commissions (or loads) on annuities can be several percent. Expenses can run you over 2% annually. Variable Annuities: What You Should Know from the S.E.C. Previously I posted about How fast do homes appreciate historically? and then I added some more on the topic with More on historical home appreciation. In summary between the two posts I found that historical home appreciation is in the 4% rate. However that is a national figure covering the average for the entire USA. You can see that there is a pretty wide spread between states. Depending on what state you are in you might have up to 2.5% difference in appreciation compared to the national average. And comparing one state to another the swing is as much as 3.7%. Furthermore the change in any given decade may vary considerably from state to state. For example in the 1940's prices went up 24% in New Mexico but only 6% in D.C. a variation of 18%. And then in the 1990's the prices rose 8.4% in Oregon but dropped 0.6% in Connecticut. In every decade there was at least a 7% difference between the state with the highest and lowest annual appreciation values. So if you are looking at trends of home prices, it really makes much more sense to look at the local since there is a pretty significant difference in price trends from one state to another. Furthermore it really makes most sense to look at the specific city or metro area, but data for that can be harder to come by. I'll see if I can find anything price trends for metro areas. The New York Times reported in this article Home Brew for the Car, Not the Beer Cup that a new company E-Fuel is working on a home ethanol mini production appliance. The unit would cost $10k and would use sugar, water and electricity to make ethanol. They say that it could make ethanol for as little as $1 a gallon if using cheap inedible sugar. Interesting idea for sure. I'll be curious to watch it and see what comes of the product in the future. The other day I posted about How fast do homes appreciate historically? At that time I had only found census data back to 1963 and some spotty data for previous decades. I calculated annual home appreciation at 5.9% for 1963-2008 and figured that dating back to the 1920's that homes have historically appreciated around 5% annually. Since then I've found another source of data going back to the 1890's. The site Irrational Exuberance from Robert J Shiller has a Excel file with the data set for home values that he discusses in the 2nd edition of his book, Irrational Exuberance. That data shows pretty low appreciation in home prices in the 1890 to 1920 period which drags the overall historical averages down. Note that these numbers are all the nominal figures and do not account for inflation adjustment. So what does all this new data tell me? First it seems the long term historical home price appreciation is 3-4% range rather than 5%. Personally I think that the data from 1890 to 1910 is much less relevant to today. At that period in time we were still transitioning away from an agrarian society and the world was a much different place. I think the past 100 years is a much more realistic measure of history if we're going to use it as a basis for what may happen in the future. Given this new historical data, I'm going to use a rough figure of 4% for historical home price appreciation. Since appreciation in recent history post WWII has been a higher 5.45% I think that a 4% figure is a decent conservative value. This census page with per capita income over time. That page covers 1959, 1969, 1979, 1989 and 1999. Another page covers more current value for 2006. From these historical values we can figure that the annual growth rate of personal income was 5.89% from 1959 to 2006. If we break it down by decade we can see that in the 60's wages grew 5.4% annually, in the 70's 8.9%, in the 80's it was 7.0%, in the 90's it was 4.1% and from 1999 to 2006 wages grew 3.4% annually. So while historically in the past 5 decades wages grew over 5% a year, in the past couple decades we've seen wage grown slow to 3-4% annually. Right now homes are generally losing value or at best staying flat. A few years ago home prices were increasing by double digits annually in many markets across the nation. Neither of these are normal situations. We've experienced first a boom and now a bust. This kind of cycle is both normal and not. Prices are going to go through cycles of ups and downs over the yeas. So we'll keep seeing cycles of booms and busts of varying sizes. But over the long run increases of +15% or losses of -15% are not going to be the typical changes in home prices. So what is the average change in home prices historically? This is a little tricky to find. I did a lot of searching on Google and I wasn't able to find an authoritative number over a long period of history. The best I found was the price history from 1963 to 2008 and some spotty data from previous decades. From historical home price information on the Census website. I analyzed the data at this Google docs spreadsheet. From 1963 to 2008 home prices increased an average of 5.9% per year. I was able to find this interesting site The PeoplesHistory.com with the page Home and Property Prices that has example prices for each decade. So you can look at the page for the 1920's and see home prices were in the $2000 to $5000 range for that decade. Or in the 1930's page they show that homes sold for $2000 to $9000 in that decade. We can use these numbers to give us a rough estimate of the average annual % increase over time. For example if we estimate the cost of a home in 1920 at $3500 and then compare it to a $230,000 home price today in 2008 then that comes out to about a 5% annual increase. similarity if we look at the 1930's prices and estimate a cost of $5500 for 1930 then it gives us a 4.9% average annual increase to get to today's prices. If you combine the census data for 1963-2008 and the sample information from older decades then I think its a pretty decent estimate to say that prices increased 5% annually. Admittedly this is not a perfect number since I don't have solid data before 1963. Therefore from 1940 to 2000 rent increased at an annual rate of 5.31%. There are a number of financial topics where it is useful to know the annual growth rate of an asset or cost. Lets say for example that I invested $1000 in a stock in 2003 and today in 2008 that the stock is worth $1300. How do I know the annual % growth of my investment? Note the ^ symbol there means that the first figure from (ending value / start value) is taken to the power of the second figure ( 1 / # years). If you are in Windows for example the built in calculator has a x^y button in the scientific view mode. Or you can also use the ^ symbol in a formula in Excel. OK lets apply this to another example. Lets say that in 1998 I bought a house for $160,000 and today in 2007 the house is worth $225,000. How much has my house appreciated in value per year? You can also use the formula to find out how much % an asset has lost value. Lets say that my house peaked at a value of $240,000 in 2005 and then dropped to $225,000 in 2007. What is my annual rate? I've been discussing ways to save on gasoline costs. Another way to save on gas is effective use of the GasBuddy.com website. GasBuddy is a collection of websites for each state and major city that shows recent gas prices for that area. The information is entered by users of the site and usually updated fairly frequently. Its a real handy site to quickly find the cheaper gas stations in your area. This will bring up your local page with gas prices in your area. This information alone is pretty handy and if the cheapest station is close by or within your normal driving path then that's all you really need to do. To find the cheapest station nearby or in your driving path the map option on GasBuddy is pretty handy, click on the 'Map Gas Prices' button in the menu at the top of the page. This lands you on a map of the local region with as prices shown by location. To narrow the map to your side of town you can put your zip code in the search box on the map itself. Now you can visually see where the stations are and their prices. Scan the map for your neighborhood or path to work, school and find the cheaper stations. If I use Gasbuddy on my area I can quickly and easily see on the map that while there's a station with $3.65 gas right on my way to/from work but just 1 mile over there's a station selling gas for $3.55. The idea for this topic was prompted by reading the article 'My Tax Mess' on Free Money Finance discussing his tax issue. FMF donated some mutual fund shares to a charity last year. If you have an asset like a stock or mutual fund that has increased in value then it may save you some extra tax dollars to donate that asset to a charity instead of giving the charity cash. Lets look at an example. Lets say you routinely give $1000 a year to your favorite charity and you have some Exxon stock that you bought a few years ago that you're planning to sell this year. Lets also assume your federal marginal tax rate is 28%. Giving cash: If you give your charity a cash gift then you'd give them $1000 and deduct that from your taxes and save $280 on your tax bill. When you sell that Exxon stock you end up paying capital gains taxes. You bought 50 shares of the stock in 2003 when it was trading for $35 a share and not its going for $94 now. So if you sell your 50 shares you'll get $4700 and owe capital gains on $2950 of that. Your capital gains tax bill will be $443. Between the donation and your stock sale, your charity gets $1000 and you walk away with $3537. Giving Stock: If on the other hand you gifted the Exxon stock directly to the charity you can avoid that capital gains tax bill AND still benefit from an income tax deduction from the gift. Lets say you gift 11 shares of your stock straight to the charity thats a gift value of $1045. That leaves you with 39 shares of stock you sell for $3705. Your capital gains bill on that is $210. So if you gift stock your end result in this example is the charity gets $1045 and you walk away with $3787 after taxes. United Way's website has a calculator that shows side by side comparisons of gifting stock versus cash if you want to play around with other examples. Of course this only works if you owe taxes on the stock. If you had instead bought Washington Mutual in 2003 instead of Exxon you would have about $28 /share loss for that stock. Gifting your WAMU to your charity would potentially hurt your tax situation cause if you sell that stock you could write off the loss. So in summary if you have stock you're looking at selling and give money to charity then you should consider the option of gifting the stock to the charity outright. Gasoline is getting more expensive all the time. So many of us are looking for ways to save a few bucks on gas. One obvious way we might try to save on gas is to buy at the cheapest station. If the station by my house is currently charging $3.45 for regular and there's a station on the other side of town charging just $3.29 then I would prefer to buy at the cheaper station right? If I have a 15 gallon tank and fill up for about 14 gallons then I'd be saving $2.24 every time I fill up. But what if that other station is 5 or 10 miles out of my way? Remember that it costs money in gas to drive out of your way. Before you consider driving out of your way to a cheaper gas station, figure out how much it will cost you in gas to do so. As a simple rule of thumb: I would think first before driving more than 1 mile round trip out of your way per 1% difference in the price of gas. This is a rough rule of thumb and the exact break even point is going to depend on the size of your gas tank and the MPG rating of your car. But the 1 mile per 1% cost rule of thumb is close enough for ballpark figuring and relatively easy to remember. For example if the gas is 5% cheaper then don't drive more than 5 miles to buy it (2.5 miles each way). Say gas is $3.20 closer and $3.14 farther away (5% difference) if your car has a 15 gallon tank and gets 20 mpg then by driving 5 miles you'd be using $0.90 in gas to save $0.78 on the fill up, which is only a $0.12 savings. To figure your own exact savings you need to know your own cars MPG rating and your cars gastank size. The gastank size is often listed in the owners manual. You can figure your actual MPG by measuring your mileage on your odometer and dividing by the gallons you use at a fillup, but do this over several fillups and average out the results. What I would recommend instead of driving out of your way is to shop the cheapest gas station that's in your normal driving area. OK so what do I mean by "normal driving area"? I simply mean the places you normally go. This would include your path to and from work, your route to the grocery store and any other places you normally visit. Look for any of the cheaper gas stations in your normal driving areas. Then look to see if any of the cheaper stations are a little bit out of your way from your normal trips. So lets put it all together and do a comparison example between driving too far out of your way and just staying in your normal driving range. Lets say my car has a 15 gallon tank and I fill up for 14 gallons at a time and it gets 20 mpg. I drive to and from work every weekday. Its a 3 mile trip each way. There is a grocery station right on that trip that is $3.45 right now. But if I drive just 1 mile out of my way on my way home I can swing by the local Costco and fill up for $3.27. That 1 mile extra only costs me 1/20 gallon ($0.16) and I will save $2.54 total filling up at Costco less the cost of travel. If however the only Costco was 16 miles out of my way then I'd be spending 16/20 gallons = $2.62 in gas for the round trip and actually only saving $0.08 to fill up at the cheaper station by driving too far to do so.